SkinRenew Laser Medical Center offers only the best for its clients. We spent the time to investigate, compare, and research to select the best of the best for our clients. SkinRenew Laser Medical Center partnered with the international leading aesthetic laser company to bring to its clients the state-of-the-art technology in laser hair removal. We are proud to introduce to our clients the Quanta Light Series – the most technically advanced, safe, powerful, and effective laser hair removal system available in the aesthetic industry. Laser hair removal has never been so easy. Powered by dual laser systems, 755 nm Alexandrite and 1064 nm Nd:YAG, Quanta Light Series provides power, precision, and flexibility to treat almost any skin types safely and effectively. FDA gave its seal of approval for the permanent reduction of hair growth. Unlike shaving, waxing, tweezing, threading, or any other depilatory methods available, laser hair removal reduces the number of hair follicles permanently. Laser hair removal is one of the most popular cosmetic procedures in the U.S. It is a technique utilizing highly amplified light to penetrate through the skin to an individual hair follicles. Melanin (pigment) in the follicles absorb the light. The intense heat of the laser damages the hair follicle, which inhibits future hair growth. All hair goes through three distinct phases. Different locations of our body have different amounts of hair growing in different phases. Unlike other mammals, human hair growth and shedding is random and not seasonal or cyclical. 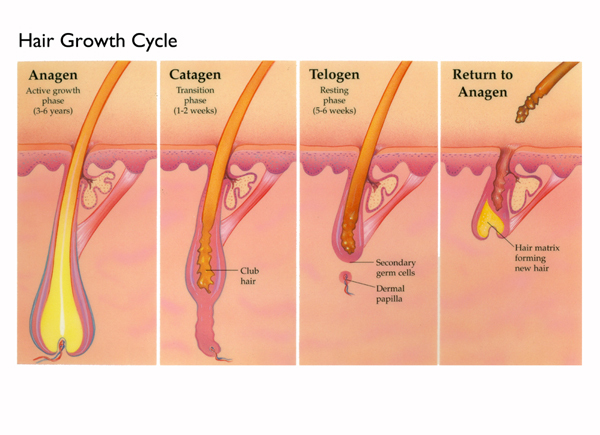 At any given time, a random number of hairs will be in one of three stages of growth and shedding: anagen, catagen, and telogen. Anagen is the active growth phase that lasts several years. The cells in the root of the hair are dividing rapidly. The hair is thicker and more pigmented in this phase. This pigment serves as a “target” for the laser; thus, it is important to treat each follicle during the growth cycle for maximum hair reduction. Catagen is the transitional phase, lasting only several weeks, during which the hair stops growing, but is not yet shed. Growth stops and the outer root sheath shrinks and attaches to the root of the hair. This is the formation of what is known as a club hair. Telogen is the resting phase. During this phase, the hair follicle is completely at rest and the club hair is completely formed. It lasts weeks to months, and at the end of this phase the hair falls out and a new hair begins to form. About 25 to 100 telogen hairs are shed normally each day. During the latter two phases the hair follicle is “hibernating” and relatively immune to any type of hair removal treatment. The number of treatments required varies from individual to individual. Hair growth cycles vary on different parts of the body. Your skin and hair color, coarseness of hair, as well as your age, metabolism, gender, ethnicity, hormones, and other individual factors that influence hair growth rate, will determine the number of treatments you’ll need. Each treatment permanently reduces 10% – 20% of the treated hair. Less hair grows back with each treatment. Although laser hair removal effectively reduces the number of hair follicles and slows the hair growth, it does not guarantee permanent hair removal. It typically takes multiple laser hair removal treatments to provide an extended hair-free period. Periodic maintenance treatments might be needed as well. WHO CAN BENEFIT FROM LASER HAIR REMOVAL? Any one can benefit from laser hair removal. However, hair color and skin type influence the success of laser hair removal. Laser hair removal is most effective for people who have light skin and dark hair, because the laser light targets the melanin (pigment) in the hair. However, advances in technology have made laser hair removal an option for people who have darker skin type. At SkinRenew Laser Medical Center, powered by precision and flexibility of dual laser systems of Quanta Light Series (755 nm Alexandrite and 1064 nm Nd:YAG), we are able to provide treatments to almost any skin types safely and effectively. Laser hair removal generally is not effective for white, gray, red or blond hair — although treatment options for lighter hair continue to be investigated. Laser hair removal is commonly used to remove unwanted hair on the face, neck, armpits, chest, back, genital area, arms, legs, fingers, toes and feet. It is possible to treat unwanted hair in nearly any area – except the eyelid and its immediate surrounding area due to the possibility of severe eye injury. Laser hair removal is more than just “zapping” of unwanted hair. It is a medical procedure that requires advanced training to perform and carries potential risks. At SkinRenew Laser Medical Center, all procedures are performed by Dr. Kwon-Hong or by her nurse Supinder Tiwana, R.N. under the direct supervision of Dr. Kwon-Hong. Hair is not to be waxed, plucked, tweezed, or threaded at least 4 weeks prior to the planned laser treatment. Additionally, use of depilatory agents, such as hair removal creams, or depilatory procedures, such as electrolysis, is not advised. Shaving is recommended for optimal efficacy of laser treatments. The laser light targets the melanin (pigment) in the hair follicle to effectively treat the unwanted hair, and any depilatory method except shaving can temporarily remove the hair follicle, resulting in suboptimal treatment. Avoid sun exposure or use of sunless tanners to the area of treatment at least 4 weeks before and after laser treatment. Use sunscreen with SFP of at least 30 to protect the skin. Recent sun exposure is contraindicated with laser treatments. A tan from any source can decrease the effectiveness of the laser treatment and increase the risk of complications, such as laser burn, scars, or permanent skin discoloration. Waiting until the tan fades is advised. Prior to the laser treatment, you will meet with our SkinRenew laser hair specialist for consultation to learn about the procedure, to determine if you are a good candidate for the procedure, and to review your overall medical health. Shave the area to be treated a day prior to your appointment day. The hair follicles should be visible, but it can be more painful if longer hair is present during the laser hair removal. Take the oral antiviral if prescribed. Most patients do not find the treatments uncomfortable or objectionable. Each laser pulse feels like a brief sensation of heat or feeling of snapping of rubber band or hot bacon grease on the skin. Certain skin areas may be particularly sensitive, such as the upper lip and bikini area. At SkinRenew Laser Medical Center, we use Zimmer Cooler that blows cold air to chill the area of treatment before, during, and after the procedure for your maximum comfort. If you desire, an anesthetic cream may be applied to minimize any discomfort. When the procedure is completed, you will be given an anti-inflammatory cream or lotion to ease any discomfort you may experience. You may schedule your next treatment four to six weeks later. Routine treatments are advised until you obtain the degree of hair thinning or elimination you desire. Then periodic maintenance is encouraged. For a day or two following your treatment, the treated area of your skin may look and feel as if sunburned and may be accompanied by slight swelling. Cool compresses and moisturizers (aloe vera gel) may help soothe the skin. Also you may use over-the-counter hydrocortisone 1% to relieve itching, redness, and swelling. If your face was treated, you can wear makeup on the following day. Over the next month, your treated hair will fall out. Don’t mistake this for hair regrowth. After laser hair removal, avoid sun exposure — both natural sunlight and tanning beds. Wear sunscreen at all times to help prevent temporary changes in the color of the treated skin. The realistic goal of laser hair removal is “permanent hair reduction.” Although existing laser research indicates that laser treatment is a safe and effective method to remove hair, there is no guarantee that laser treatment will completely eliminate your unwanted hair permanently. Some hair may not go away completely or may be resistant to the laser treatment despite the best efforts made. Results vary greatly from person to person. Even with persistence of hair, most people report improvement in thickness and color, and longer length of hair-free period. Skin irritation. Temporary discomfort, redness and swelling in the treated area, which usually lasts for a few hours. Discomfort can be eased with regular ice application. Pigment changes. Laser hair removal might darken (hyperpigmentation) or lighten (hypopigmentation) the affected skin, usually temporarily. These reactions, which are more common in patients with olive or dark skin tones, can worsen if the laser-treated area is exposed to the sun. Therefore, avoiding sunbathing and tanning bed before and after laser treatment is crucial. Rarely, laser hair removal can cause blistering or crusting. These can take 1 to 2 weeks to resolve. “Picking” the scabs or “popping” blister may cause skin infection and lead to scarring.